To say that this bottle is insulated is a bit of an understatement. I can put ice in, and many hours later, it’s still there. So, if you want a bottle that keeps your water cold all day, this would be a great option. The bottle also includes an interior mesh filter to keep ice (or tea leaves) from escaping when you drink. The bottle is also sweat-resistant, but as I tried it in cooler, less humid weather, it’s hard for me to judge that feature. I never noticed any sweat on the outside of the bottle, even when it had ice inside. On the reverse side, thinksport also keeps hot beverages hot, maybe to a fault. You should heed the warning on the package about assuming the temperature of your beverage will be the same hours later as it was when you put it inside. For example, I poured some coffee directly from the pot into the bottle. When I opened the top later, I discovered that the coffee was still hot enough to burn my tongue. The coffee never got a chance to cool as it would sitting in a mug. Perhaps you should make sure your hot beverage is at a ready-to-drink temp when you pour it into this bottle. Otherwise, you may need to leave the lid off to let it cool briefly. Since the bottle is double-walled, the hot coffee never heated the outside of the bottle. It was still comfortable to hold, unlike the standard SIGG which is uncomfortable to hold if you put anything hot inside. The shape of the bottle is handsome, and it’s easy to hold. Yet, the wider bottle may not fit into some auto drink holders. The whole thing is BPA free and also free of PVC, phthalates, lead, cadmium and anything else considered toxic. The opening is wide enough to make bottle cleaning easy. The drink spout is about the size of a plastic soda bottle, but taller. I found it very comfortable to drink from. Overall, I’d recommend this bottle if you’re looking to control the temperature of your beverage, or if you just want a more elegant bottle. 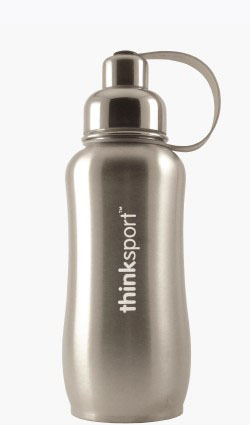 I never noticed any strange taste to my water when drinking from thinksport. I’d feel comfortable giving thinksport as a gift.